Twisty roads, oh, how we love them. Give seasoned motorcyclists a windy, curvy road, and they are in heaven. The more curves the better. 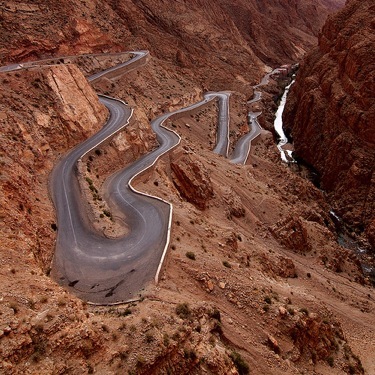 There's nothing better than a really great twisty road. That's not how I felt when I was a beginner rider. They didn't really teach me how to ride "real" curves in the MSF course, although I learned how to turn, how to look through the turn, how to throttle through the turn - How to "stay up" through a turn. Oh, I could turn the motorcycle to make a right turn, and a left turn, no problem. But a curvy, twisty road - truly scary. The first year, I faked it. Yep, totally faked it. I would accelerate in the straight-aways, then brake when I saw a curve. 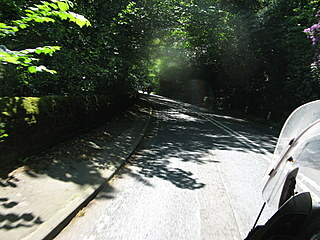 I would then ride very carefully and slowly through the curve and then speed up again when the road straightened out. If I was riding in a group, I tried to stay at the back of the pack, where no one would notice my "method." My tires and brakes took a beating, but I made it through my first year. I knew that my "method" was wrong, but I lacked the self confidence to correct it. Then came Spain, and my "method" failed me Big time! We traveled with our motorcycle "group" to Spain for a 2 week vacation on motorcycles, through Iberian MotoTours. We met Scott and Chano, our leaders, and were assigned motorcycles of our choosing. I was the only female rider in our group, and without a doubt the most inexperienced. I had a BMW similar to the one I had recently purchased, although with a larger displacement and ABS brakes, which were new to me. The trip was through Andalucia, beginning in Sevilla and ending in Cordoba. The highlight of the trip for most of the members of our group: The curvy roads. For me: Yikes! Day One: We rode through a light rain from Sevilla to a little resort on the Atlantic Ocean. The roads were mostly straight, but there were some curves...and I used my "method." Speeding through the straight road, braking at the curve, riding carefully through the curve, and then...speeding to catch up. Day Two: More of the same. Day Three: Our very wise leader suggested that I take a little lesson on riding through curves with the co-leader, Chano. Embarrased, but grateful, I agreed. I was a pretty needy student, but that day on a small mountain road in Southern Spain, I learned from my motorcycle god: Chano - how to successfully and joyfully ride a motorcycle through a twisty, curvy road. My instructions: Envision a 12 foot rope from his back tire to my front tire, linking our two motorcycles together. Next, watching only his motorcycle, mimic his movements - i.e., follow the rope, matching the movements of his bike with mine. Scary proposition, but I did it. And I noticed that there was a method that he was following, a method unlike mine. A method that felt safe, allowed for some speed through the curves, and was actually fun. 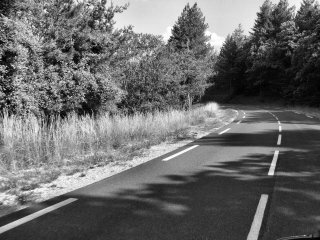 The method: As I saw an approaching curve in the road, I was to slightly move the bike to the opposite side of the road from the curve. Then as I approached the curve, I was supposed to ride through the curve at it's widest angle, turn the bike slightly into the curve, and then as I reached the apex of the curve, throttle forward, and speed through the curve. I would maintain the lean of the bike until the road straightened up, and then I would stop the lean. That morning, I followed my leader through curve after curve after curve, to the point where I got the rhythm. The rhythm was strickenly similar to the rhythm that I felt as I skied down a hill. 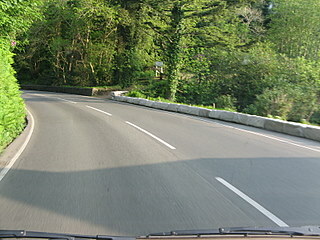 With a twisty road, I would set up for the curve by riding to the outside edge, then leaning through the curve, speeding up in the middle, and then straightening up at the end. Easy. I had plenty of practice during the rest of our vacation in Spain, and at our final dinner, I was given an award: The most improved rider. Well earned, thanks to Chano. You remain my motorcycle god. Ride at the speed at which you are comfortable. Set up the curve by riding to the outside edge. Throttle back as you enter the curve. If you must brake, use only the back brake, never the front brake. Lean into the curve and follow the curve at its widest edge. If you feel as if you are going too fast, lean further into the curve, or just throw your inside knee down. As you reach the apex (or the middle) throttle up. Look through the curve, ahead, not down at the road. Get ready for another curve! 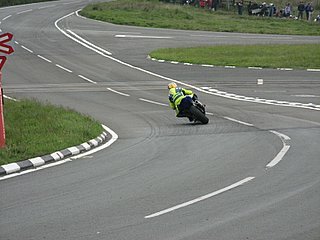 Curves and Cornering: Experience is Vital! 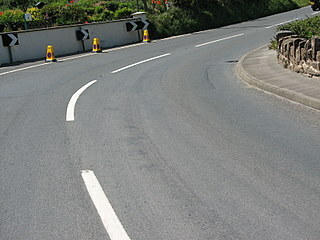 Statistics show that the majority of single-vehicle motorcycleaccidents occur as a result of poorly executed corners or curves. Riding through curves and twists safely and skillfully requires judgment and timing - both of which only come with experience. Remember to ride at your own pace, only travel through a curve at a speed at which you feel safe and in control of the motorcycle. Don't speed into a curve, slow down either by throttling back, slightly braking, or down-shifting. Do not brake in the middle of a curve, a better response is to to throttle back more, and to lean more with the bike through the curve. The best advice: Until you are an experienced "curver", it's better to enter curves slower, and to increase your speed by throttling through the exit of the curve. And remember to look through the curve. The motorcycle will follow your line of vision, so look ahead, through the curve. And have fun! Practice does make perfect or at least proficient! Not many of us will ride through the twisty roads like a TT racer.